For COCO 2-months-old female German Shepherd, the situation is all too real. Her owner didn’t want her anymore, and so in a stunning betrayal, the pup was placed at Carson, where her situation is as dire as any new resident at the facility. COCO, who is trying to keep all hope alive, has broken down emotionally, according to a source at the shelter who wished to remain anonymous for this story. COCO is the cutest baby you will see today! Please SHARE, she may need some help. Thanks! 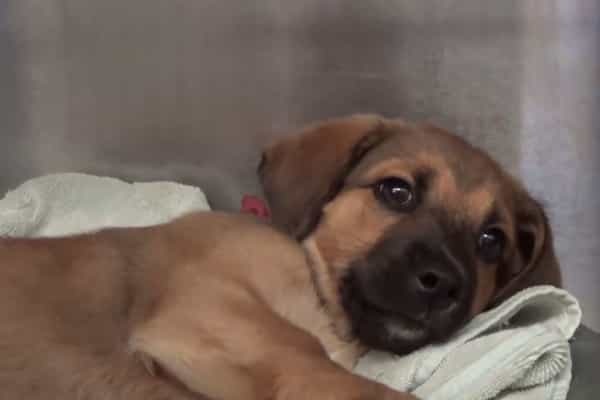 #A5119480 My name is COCO and I'm an approximately 2 month old female German Shepherd. I am not yet spayed. I will be available on 10/14. You can visit me at my temporary home at C401. 44 Responses to "Nobody want her....still listed. 2 months old German Shepherd begs for her life"
Can anyone give this sweet girl a home?? I would love to adopt her, but problem is, I live in South Dakota. I have been wanting a female German Shepherd. I wouldn't know how to go about getting her. Please, if you want to save her call the shelter now and let them know. You can also call your local shelter and let them know you want to save her. They can tag her and set up transport for you to get her. Please don’t wait bc her life is in danger of being put down. How much does she weigh? DART Delta Animal Rescue Transport might be able to transport her if she isn't too big! I can get her in the morning! We have been wanting a female Shepard. I'll pick her up if she's still available? I am also the anonymous person too so I'm very much wanting her and I'm local. In Facebook you can find dog rescue transport groups. A lot of these dog rescue transport groups are volunteers. That means, that they will transport the dog for free or barely anything. Contact them and see how this whole thing can work out. Sometimes, certain (local) rescues have to pull a dog from a shelter first and then you can adopt the dog (or the cat). Google and Facebook should be able to help you find such pet rescue transporters and/or local rescues. What all you want to be adopters need to do is put your money where your mouth is. Sorry to be so blunt...call the shelter...call a local rescue to help you...call a transport company. Think about what needs to be done, and do it. That's how you save a puppy's life. Please update. Has she been adopted? I will be more than happy to help & share the cost of transport, if anyone truly adopts her! For everyone who "says" they want her...go do it!! It's not hard...drive to the shelter, adopt her, take her home. Do not ask the shelter to call you or email you...they are overworked and understaffed! Local people please. The shelter will not "ship" her or arrange it either. Sorry to be blunt but I'm tired of reading all the "I'm in blah blah can you ship her, or can you email me". I live in Benton,Kentucky and I will gladly adopt her. Does anyone have an update on her? I sure hope she got adopted! Is there anyone local who can go in and place a commitment to adopt (since it has to be done in person)? If so I will make arrangements to get her to me. Please help!!!! Molly I am calling now. When could you get her? I will adopt her! I'm in California. What do I need to Do? I want her she is precious! IF YOU WANT HER, DRIVE TO THE SHELTER AND ADOPT HER. The shelter will.not call you..if you are serious about adopting her..call the shelter, talk to their adoption coordinator, then get in your car and drive there, pay the fee and take her home. If you need a rescue to pull her, call one and have them call and email the shelter...then call a transport group and arrange transport. Talk is cheap...action speaks louder. SAVE THIS BABY. I have sent this picture and article to several rescue groups...what have you done?? As it has been stated before. Call the shelter! The information is there, they are not reading emails and responding.Call them directly! ! I went to their website and could not find her after doing multiple different parameter searches, including her animal ID number. Makes me think she has been adopted. Just called Carson Animal Shelter and Coco has been adopted!!! Thank you to whomever adopted her! I just called. This little girl was adopted on the 18th. I would have loved to have her. I'm sure she'll enjoy her new home! There are many Animal transfer groups. drivers know drivers. Sometimes it takes a week or so but check in with a group they will do whatever they can to get your have to have rescue with you in no time. I just checked the County of LA website, and there is no dog listed with that impound #. Read the posts people! It says she's been adopted since the 18th of October.